It’s no secret that the Travis CI team likes good coffee. We like it so much we regularly share it with you guys at our coffee meetups. Quite a few of us are living in Berlin, and it’s about time we share our favorite coffee spots around the city, some of which we even call our second offices. One of the first coffee shops in Berlin to serve the great coffee from Square Mile in London, The Barn is now roasting their own coffee, heavily inspired by the likes of Square Mile, Coffee Collective and Tim Wendelboe. The Barn Roastery is their big shop and roastery, and it’s quite glorious. It’s closed on Mondays for roasting, but any other day you can get a glorious V60 brew, an AeroPress, a siphon or even a Chemex from their brew bar. Of course you get to watch the whole ordeal of brewing the coffee as well. The Barn is one of my personal favorite, and their espresso roasts are the ones I usually drink at home. You’ll occasionally find some of the Travis CI team sitting here, talking about bacon and other things. There’s no wifi in the shop, it’s a place to sit and enjoy your coffee. There’s a big communal table, where you can pull out your laptop, but bring your own internet if you do. The Barn’s beans are for sale in their shop for you home brewing pleasure too. Some say, they’re selling the Mother of all Cheesecakes here, and they’re right. Five Elephant is located in the heart of Kreuzberg. They’re roasting some of the greatest coffee in Berlin and their baking skills are unrivalled. There is wifi here, but you’re asked to be a nice person and find a seat in the back if you’re looking into working here. Depending on the season, look out for their Obata from Brazil, the Tegu from Kenya, or one of their Ethopian coffees. Their roasts are pretty amazing, so you’re well advised to buy a bag. You can shop online for their coffee too. For the latter half of 2013, Silo Coffee officially turned into the Travis CI HQ in Berlin. We were very close to officially changing our business address to get our mail delivered here. Silo is fairly new, but has nice interior, a great communal table in the back, and wifi too. They serve a mix of local beans and coffees shipped from other German and European roasters. Their cheesecake is pretty amazing too, it’s right up there with the one from Five Elephant. A great little spot right in Prenzlauer Berg, run by the local coffee cupping champion. Cafe CK serves Sølberg & Hansen coffee and excellent banana bread too. For extra style bonus, coffee is served in wine caraffes and whisky glasses. They’ve got wifi too, so you can spend some time here, working and sipping your way through a great collection of high quality coffee beans. 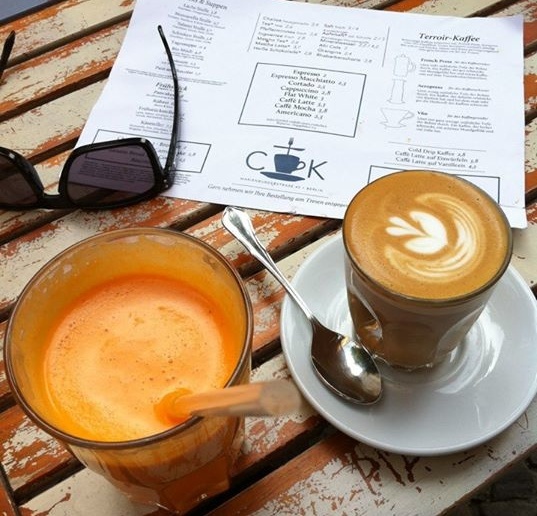 Well known for their giant vintage cash register and great coffee, No Fire No Glory is located right in the center of Prenzlauer Berg, and just up the street from Cafe CK. They serve a nice mix of coffee from Five Elephant, and Coffee Collective from Copenhagen. There’s a nice outside area on the sidewalk where you can sip your coffee, enjoy a giant piece of delicious cake and get some work done, thanks to the wifi. Located very close to Checkpoint Charlie, this is the most stylish coffee shop around, and it’s web worker friendly too. The shop is beautifully decorated with Scandinavian furniture and serves both coffee from Five Elephant and Drop Coffee. The shop has a nice communal working table, including power plugs, and good internet, so you’re welcome to stay and work here. They serve a great variety of food for the sweet tooth and lunch too. If you’re lucky, the sun is out and you can sit in the amazing backyard. But what if I’m not in Berlin? No worries, you can still enjoy the fine coffees that our beautiful little city has to offer. You can buy beans from The Barn, from Five Elephant, as well as locals Coffee Circle. Our friends from Silo offer a curated coffee subscription too, sending you a selected bag of filter coffee every month. The Barn and Five Elephant offer coffee subscriptions too, shipping great coffee directly to your home or office. Both ship internationally. At Kaffee Bitte, they ship a curated coffee subscription to your (currently German) home too. You pay by the bag rather than upfront, so you can cancel or change your subscription any time. Berlin’s coffee culture has been growing greatly over the past couple of years, and it’s a pleasure to watch for us coffee enthusiasts.